The evolution of the house has been grouped into five architectural phases dating back to the First Spanish Period. Following are brief descriptions of each of those phases. 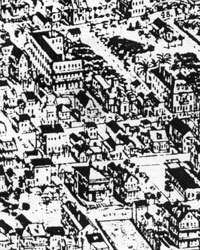 The original building was probably constructed as a two-story structure with two rooms on each floor. The second-floor opening was of wooden planks on exposed joists and the first-floor flooring was tabby concrete. A one-story loggia provided covered entry from a fenced courtyard on the south side of the building. There were no windows in the north wall, and an interior stair provided access to the second floor. The roofs were flat with a tabby concrete topping and rafters exposed to view. Window openings were equipped with interior shutters and windows on the first floor facing the street were equipped with rajas. Though none of the original doors or windows remain, some of the current doors and windows are probably in original openings. Most of the changes during the second architectural phase would probably have been completed before Father O'Reilly purchased the property from John Mowbray at the beginning of the Second Spanish Period. The tabby concrete roofs were probably replaced with a wood-shingled gable roof during the late First Spanish Period or the British Period. The deteriorated remains of this phase are visible on the sketch of the O'Reilly House made by Rev. Henry J. Morton in 1867. (This sketch can be viewed in the Then & Now section. If constructed as shown in the sketch, the ridge of the gable was oriented east-west and centered above the two-story block, and one side of the gable extended over the loggia. Since the new roof protected this wall over the loggia it may have been replaced with a wood frame wall with wooden siding, particularly if completed during the British period. Thus the existing wood framing of the south walls of the two existing larger rooms on the second floor may date from this period. Another stairway would also have been added from the loggia to the second floor. The present configuration of the building was essentially completed during this phase, which probably occurred at various times between 1867 and 1910. During this phase the roof and second floor framing were completely removed and a new gable roof was centered above the full north-south width of the building. The loggia was probably enclosed at this time. The existing stairs were constructed using simple Greek Revival newels, treads, balusters, and a handrail. The long-leaf yellow pine attic flooring has a thickness of 1-1/4" and widths that vary from 6" to 14". Boards of these dimensions usually were not available after the Civil War, so the flooring probably dates from the second phase and the boards were relocated from the second floor since earlier nail holes are visible in the boards. The six panel doors throughout the house are typical Greek Revival and probably date from this period. A chimney with fireplace was provided in the west wall of both the first and second floor rooms located in the northwest corner of the house, if not provided previously. A second chimney, visible in the 1890 photo that can be seen in the Then & Now section probably served cast-iron coal or wood stoves. During the 1940s the building was repaired and refinished. A new coquina chimney replaced an earlier chimney of the west walls of the rooms in the northwest corner. The chimney in the east end of the north wall was removed above the roof, but remains visible in the attic. New decorative quarry tile floors and baseboards were installed in the first floor. The door leading to the south courtyard at the foot of the stairs was replaced with a window. A new door was provided below the stairs. Electrical work was updated at this time. Security systems were installed during the 1960s and 70s. The building was totally restored from 2001 through 2002. The restoration did not return the building to a previous period, but preserved the configuration that existed at the time restoration was begun. However, plumbing and electrical services were updated to meet contemporary codes. During the restoration, the opportunity was taken to further study the work done during the previous architectural periods. 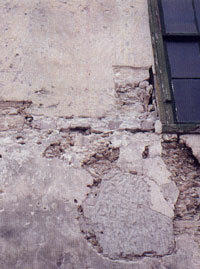 In places, the walls were stripped of plaster and taken down to expose the original tabby and coquina. This proved helpful in more accurately dating the age of the original structure. 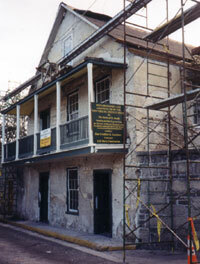 It was decided to restore the house with the intention of it being used as a museum that would tell three main stories: that of the house itself; the Catholic tradition that has been the common thread since Menendez and the original Spanish settlers landed almost 450 years ago; and the Sisters of St. Joseph here in St. Augustine. The exterior paint scheme was returned to how it is believed to have looked at the time of the third architectural phase. The garden wall was again opened and a new gate installed and the garden itself was created to be an authentic representation of an early 19th century St. Augustine garden. Plaster removed from the north elevation, during the restoration, revealed walls approximately 15" thick, constructed of tabby and coquina not previously documented in St. Augustine. 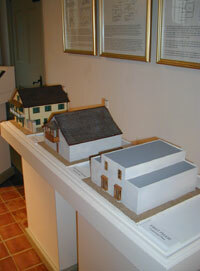 Scale models of the three most visually distinctive architectural phases, representing the 17th, 18th, and 19th centuries, are on display in the Father Miguel O'Reilly House Museum. The painstaking restoration efforts, begun in 2001, also called for extensive study of the house to learn more about the previous architectural phases dating back to the First Spanish period.